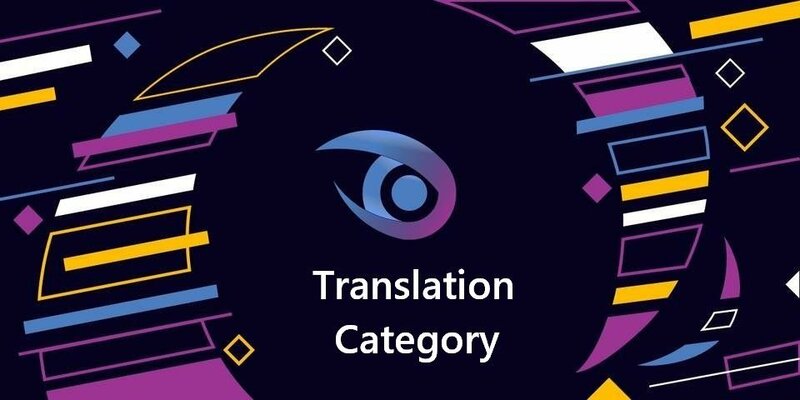 Therefore, the statistics and graphs will not show the contributions of the individual translators but will display the 17 language teams instead. Serbian team leads this week with 7 contributions. Followed by Spanish team with 5 contributions. 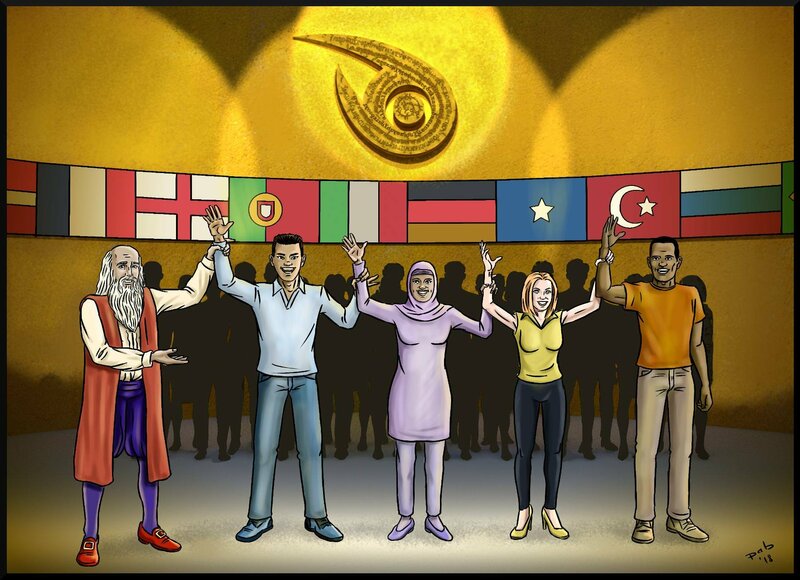 There are no contributions from Greek, German, Hebrew, Turkish and Korean teams. 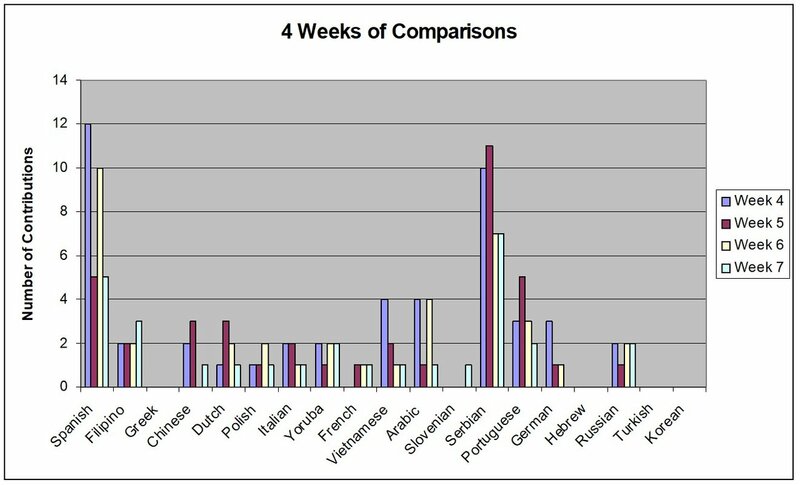 These graphs are created so that we can see the activity of each language team. On Feb 10th, Davinci Management team set up a new rule with a cap of 5 contributions from each language team. The reason behind this rule is to give all language teams equal chances to contribute to the translation category. Therefore, it is important to note that the teams are not competing with each other to produce the greatest number of contributions. The most ideal situation is to have all language teams producing an equal amount of 5 translations. This week's graph shows that Spanish and Serbian teams are the hardest working teams. Serbian team exceeded the 5 contributions because the rule was enforced on the 10th, in the middle of the week. Next week, we will be able to see that all teams will not exceed the 5 contributions. 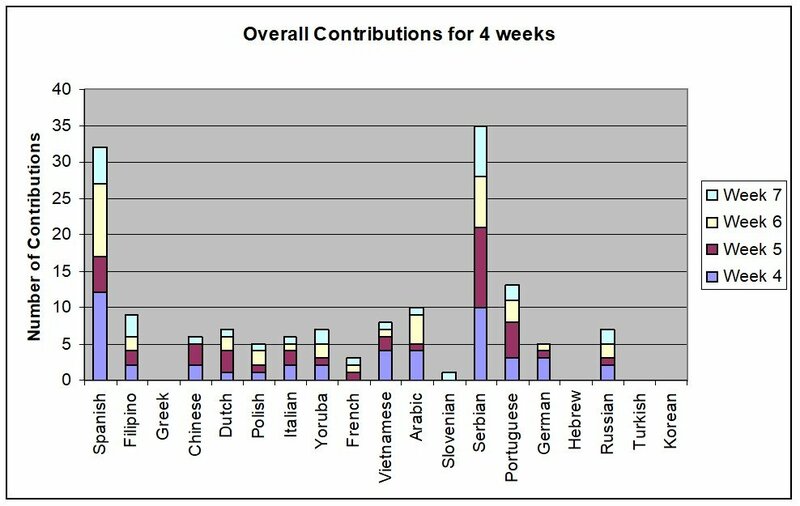 Most language teams seem to be able to only make 1 or 2 contributions per week. We need to see how to motivate them to work up to 5 contributions per week. There are no contributions from the Greek, German and Hebrew teams this week. As for the Turkish and Korean teams, they just started last week so they will need another week to learn the ropes. We will compare the total contributions in the translation category for 4 weeks time period. 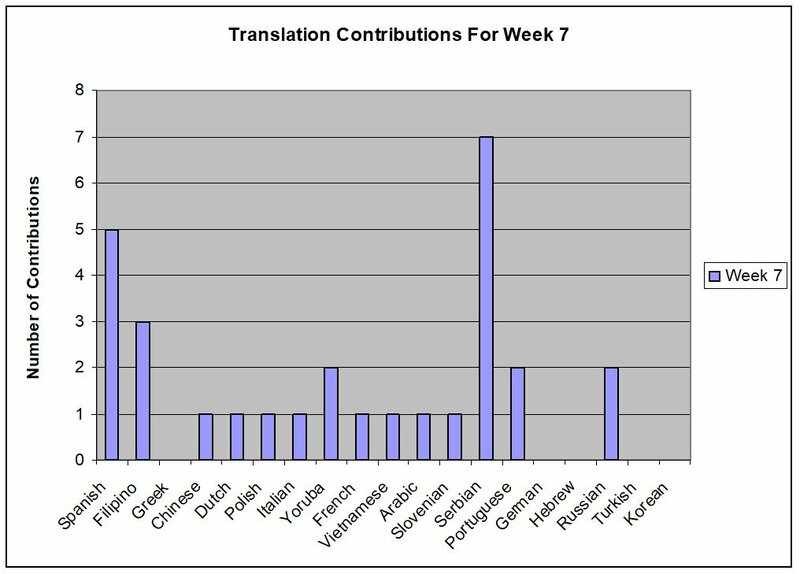 Even though new language teams were added and some language teams restructured, there were less contributions this week. It seems that it takes time for the new teams and restructured teams to get into the routine of contributions. Since the Spanish teams usually have about 10 contributions but because of the cap set for only 5 contributions, there are 5 contributions less from the hard working Spanish team. This can account for the 5 less contributions this week. Let's see what happens next week to see if we can get back to the 40 contributions range. 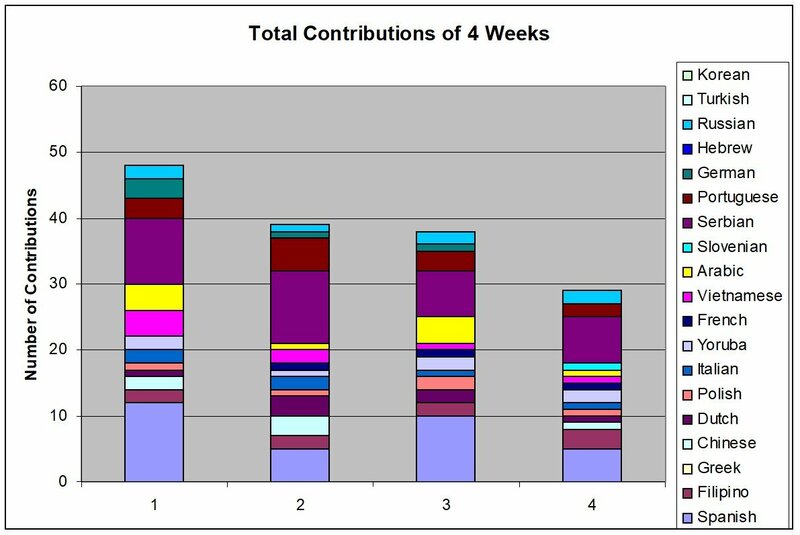 The trend at the moment is that there are less and less contributions by the week. There are 4 color bars for each language teams with each bar representing the 4 different weeks. In this way, we can get a clearer indication of which teams are getting more engaged and which teams are getting less engaged. Spanish and Serbian teams have decreased in their contribution in this 4th week because of the new cap rule on Feb 10th. Perhaps we need to investigate more into the Greek and Hebrew teams as they have been inactive for more than a month already. I know that the Greek team has been busy with family and work, and perhaps there are other priorities as 2 of the Greek translators re now actively doing moderating work for Utopian blog and visibility categories. Both Spanish and Serbian teams show consistent growth in the 4 week span. Portuguese and Arabic teams were restructured last month and their growth is looking quite positive. The German team was also restructured and did great in the beginning. Now they have slowed down a bit. For the scoring distribution, we have 30 moderators, so I need to group the scoring into language teams so that you can see the analysis clearer in the distribution of scoring. For this week's report, I decided to show also the following statistics table requested by different people. Perhaps from now on, I will also put this in my report as people seem to be interested in knowing the exact scoring given by the different moderators. From the above statistics, we see that the Serbian team takes up the 3 highest scores: 92, 90, 84. The Spanish team takes up the 3 lowest scores: 60, 58, 51. The following chart shows the distribution of scores of all the teams. 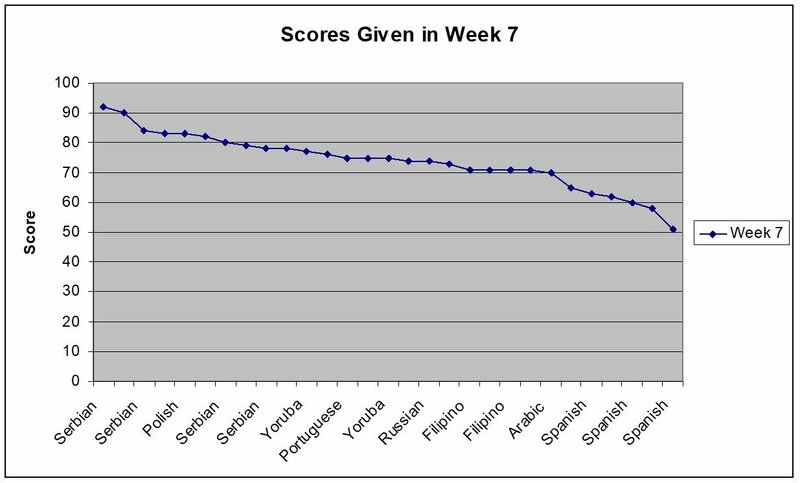 The X-axis is not able to list out all the languages for each score and only able to list out the language for every other 2 scores shown. 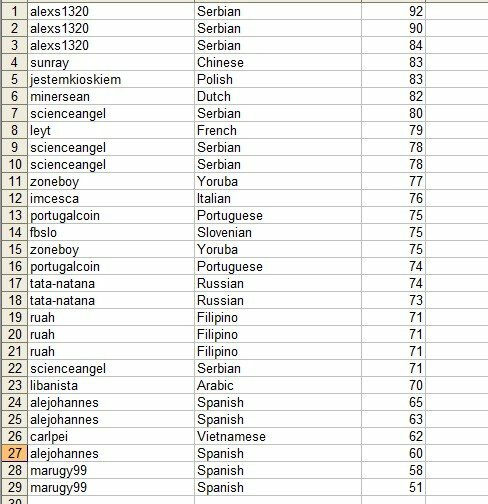 The highest score this week is 92 given by the Serbian moderator. The lowest score this week is 51 given by the Spanish moderator. About 25% of the contributions receive scores below 70. This week's scoring shows that the translators are doing quite good work: 75% scored above 70. Ideally we want every translator to score above 70 so that we have high quality translation in all the contributions. Only 25% translators fall below the 70. These are mainly found in the Spanish translators. Perhaps some remedial training is needed for the Spanish translators. 3. The average score of the Contributions is 73.8. Last week, the average score was 70. This week, there is an improvement in the quality of the translation work. Since these translators have all been screened to do translation work, the average score should be above 70 to show the quality standard. So far, we are reaching the minimal standard. Even though the 2 highest scores (92, 90) given by the Serbian teams deserve staff pick, but the Davinci Team Management has some concerns regarding the scoring given by this team, so the matter is under investigation. Audit teams have been hired to look into the accuracy of scoring of all the language teams. Until all these auditing is completed, there will be no staff pick for the time being. Please Note: DaVinci Management Team has added 2 new teams last week. They are Turkish and Korean Teams. We see that the Spanish team has already started doing some reorganization so as not to exceed the cap of 5 contributions. We want to encourage all the other teams to push up their contributions up to 5 contributions per week. The interviews with the Serbian team translators are put on hold at the moment until all matters are solved.